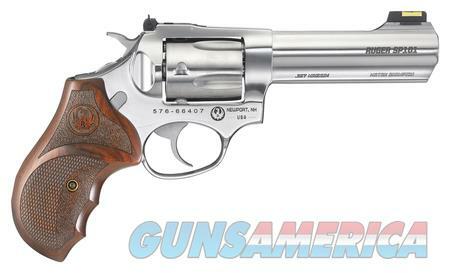 Description: Ruger SP-101 Match .38/.357 Mag., Designed for competition, personal protection and home defense. Full-lug, stainless steel barrel with gloss finish and an 11 degree target crown. Double action trigger. Custom Altamont hardwood grip with stippled and checkered sides. Transfer bar safety mechanism. Grip frame easily accommodates a variety of custom grips. Triple-locking cylinder. Fiber optic front sight and adjustable rear sight. Fluted cylinder with five shot capacity. Capable of shooting both .357 Magnum and .38 Special loads.